Seven theatre companies, seven plays, seven venues, seven days, one playwright, this is The Playwright Project. The playwright? Sam Shepard. The plays rotate through the venues nightly. The venues, in various neighbourhoods across the city, aren’t traditional theatres; they’re restaurants, bars, and cafes. 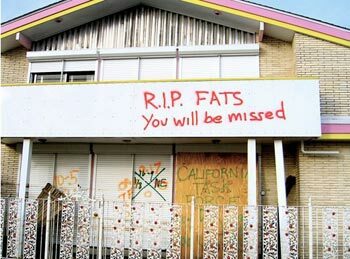 I saw Saving Fats at a restaurant on the Danforth. It’s such a great idea. You can see seven different plays in a week right in your neighbourhood. I suppose if you fall in love with a play you could follow it around town. The plays are all one act and about an hour long.Last night I saw Saving Fats at The Magic Oven on the Danforth and I’m seriously thinking about following it around town. I loved it. Saving Fats is an adaption by Alex McCooeye of a Sam Shepard short story. There are three characters; Fats Domino played by Jeremiah Sparks, The Reporter played by Caitlin Stewart, and The Hat Man played by James Wallis. The story revolves around the rescue of Fats Domino after Hurricane Katrina. Is it true? Probably not. Do we care? Nope. The Reporter is looking for a story and meets The Hat in a bar. He tells her about being rescued from his roof by Fats Domino’s bodyguard in a cigarette boat. Together they go to rescue Fats. She interviews him on television and he fleshes out the story. While this is happening Fats is playing a keyboard and singing as he prepares for a charity concert. The two sides of the story – and of the stage – don’t ever really interact; they are concurrent. All three of the performers did a terrific job. I loved Sparks’ singing and playing. Walkin’ to New Orleans is till running through my head. Sparks and Wallis both had to do southern accents and they did a fine job. The accents sounded authentic and both actors held them throughout the piece. There are 6 more performances of Saving Fats so you have lots of opportunities to go and see it. Every evening at 10 pm The Cameron House (408 Queen St W) is featuring live music in the style of Sam Shepard. PWYC.